Alrighty, guys. It’s the second recipe of February and we’re going all in for Valentine’s Day. Last week, I shared these adorable raspberry macaron hearts and you guys loved how perfect they were for this month. But today we’re all about the chocolate. After all, chocolate is the king of Valentine’s Day, am I right?? Today’s recipe is a super popular chocolate dessert to enjoy on Valentine’s Day, but with my own special twist – chocolate peanut butter souffle! You guys know how much I am obsessed with peanut butter and chocolate. Just look at these Reese’s pieces cookies or this peanut butter hot chocolate! So when thinking up new recipes for Valentine’s Day, I knew I had to make a special chocolate peanut butter treat for you guys. I hope I made you guys proud with this one – check out my Chocolate Peanut Butter Souffle! Now, if you’ve heard anything about making souffles it’s that they are super tricky. It’s that dish that if you pull them out of the oven too soon, they’ll collapse into themselves. Have you seen that in movies before? If you have, it’s probably kept you from trying this recipe for yourself. Fold the fluffy egg whites gently into the batter. If you stir too vigorously, the egg whites will get deflated and won’t help the souffle rise. You need to grease the souffle dishes really well and make sure to sprinkle with granulated sugar. The sugar helps the souffle “climb” up the sides of the dish and stay there instead of falling back down. Speaking of the souffle dish, make sure the dish has straight edges. This will make it easy for the souffle to rise. If you want the souffles to rise extra tall, you can add a paper collar to the inside of the souffle dish before filling it with the batter. But I definitely don’t think it’s necessary. Do not open the oven door before the souffle is done! I know it’s hard to leave them untouched for so long, but trust me – if you alter the temperature of the oven by introducing outside air, it could cause the souffle to fall. This is also the reason why you cannot remove the souffle before they’re done cooking. Serve the souffle immediately. Yes, straight out of the oven. The longer the souffle sits after baking, the more it falls into itself. It will still taste great but it won’t be as pretty. Once you’ve got all the above under control, you can make any kind of dessert – sweet or savory. If you’re looking for a savory version, I looooove this cheese souffle. Okay back to this chocolate peanut butter souffle. The chocolate cake is super traditional. But then we go and stuff the middle with some incredibly creamy peanut butter pastry cream. What the what?! That’s right – it’s not just plain old peanut butter but it’s a smooth pastry cream we make from scratch to give the souffle the best texture you could imagine. 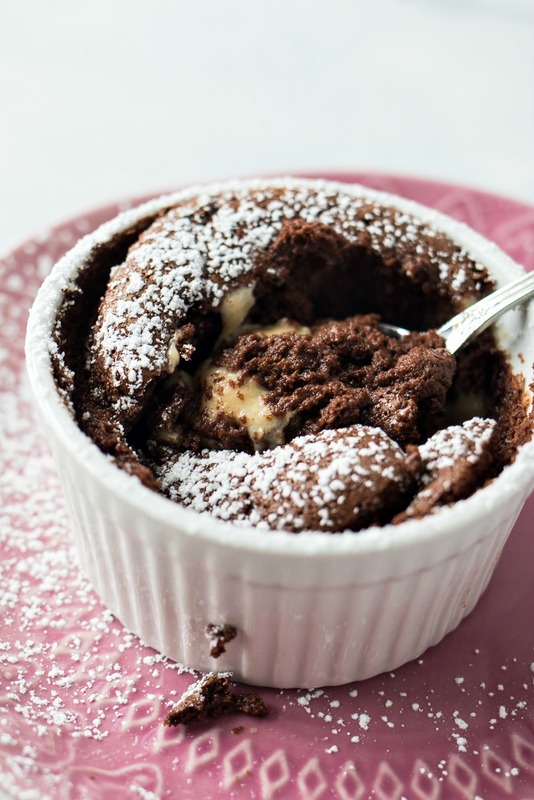 How excited are you to make this souffle?! I bet you’re more excited to eat it, right?? Rich chocolate souffles are filled with a creamy peanut butter center to make for an incredible chocolate dessert fit for any occasion. Make the pastry cream first since it needs to chill for 3 hours. Start by adding milk and half and half to a medium saucepan. Bring to a simmer over medium heat and turn off heat before it boils. In a separate medium bowl, add egg, egg yolk, sugar, cornstarch, and flour and whisk to combine. Slowly add hot milk to mixture while continuing to whisk. Pour mixture back into saucepan and return to medium high heat. Whisk continuously. Once it begin to boil, keep whisking for 1 more minute and then remove from heat. It should be nice and thick, like pudding. Add peanut butter to hot mixture and whisk until combined. Strain pastry cream through sieve to remove lumps and then cover with plastic wrap so that it's touching the cream. Refrigerate until chilled, about 2-3 hours. Place chocolate chips and butter in large microwave-safe bowl. Microwave for 30 seconds, stir, and microwave for another 30 seconds. Repeat until melted. Set aside to cool down. Whisk yolks and cocoa powder together until combined. Add water and milk and whisk until combined. Set aside. In a bowl fitted for a stand mixer, add egg yolks, cream of tartar, and salt together. Beat on medium high until mixture begins to foam. Gradually add in sugar while mixer is on medium low. Raise speed to medium high and beat until stiff peaks form. Add yolk mixture to whites mixture. Fold together gently. There may be some leftover liquid that won't fold in. Fold half of egg mixture into warm chocolate mixture. Add the remaining egg mixture and fold into chocolate mixture until combined. Be careful not to deflate the egg whites. Cover with plastic wrap so it's touching the batter. Refrigerate until pastry cream is ready. Preheat oven to 350 degrees. Prepare ramekins by greasing and then coating in sugar. Scoop chocolate cake mixture with a medium ice cream scoop and place a scoop into each ramekin. With a small cookie scoop (about a tablespoon), scoop peanut butter pastry cream on top of each chocolate scoop and push into chocolate. Place another chocolate scoop on top and spread into an even layer. Bake souffles in preheat oven for 23-25 minutes. Do not open oven until souffles are at least 22 minutes, or else they will fall. Remove from oven when done and serve immediately. Oh deary me, this sounds heavenly…my two favorite flavor combos! This looks amazing! I love anything chocolate and peanut butter!! Perfect for the upcoming Valentine’s Day! I’m so glad I found this little gem of a recipe! Peanut butter is one of my husband’s favorite foods, and I just got a bunch of uniquely flavored ones in the mail yesterday. I can’t wait to try this recipe out using each of them! I haven’t make a souffle in ages. Great flavors in this one so I might just have to give it a try again! this looks so perfect for elegant dessert and you cant go wrong with PB combo. Oh my goodness, these look amazing! I love chocolate souffles- the addition of the PB cream looks heavenly! I’m drooling over these souffles! And that peanut butter pastry cream? YUM. Well you had me at souffle. The classic chocolate peanut butter combo will never go out of style. What a great dessert….I would have a hard time only eating one. Thanks so much! I totally agree that this duo is unstoppable! This sounds absolutely incredible and I CAN’T WAIT to try it out! Peanut butter/chocolate is a family obsession around here. You had me at peanut butter! This looks delicious! I really want to try making it for Valentine’s day. Great recipe! This looks absolutely beautiful. I fell in love with souffles recently, when I visited a French restaurant. Thanks so much! So glad you’ve had a chance to try them. Now you can make them for youself! Well, these look perfectly delicious! It’s been a long time since I have tried making a souffle. I think it is time again!